Editor’s Note: Through a partnership with the University of Chicago, developmental- behavioral pediatrician, Dr. Smith leads a new Neurodevelopmental Disability Clinic at Easter Seals DuPage & Fox Valley which provides support for children with Down Syndrome, ADHD or Autism, disabilities that may include complex medical and emotional issues. Dr. Smith also leads Easter Seals DuPage & Fox Valley’s multi-disciplinary team including an occupational therapist, speech-language pathologist, developmental therapist, audiologist and parent liaison in the Medical Diagnostic Clinic. This clinic specializes in early diagnosis of young children. Individuals with Down syndrome (DS) are living longer and healthier lives than ever. There is consensus that complete information needs to be offered to all parents of children with Down syndrome (both pre- and postnatal) regarding the current experiences, health outcomes, lifespans, and quality of life for individuals with DS. DS represents a dramatic “success story” and the lives of individuals with Down syndrome are improving in every way measurable. Unfortunately, this good news is too often not being shared with new and expectant families. Doctors are not prepared for this task and parents report frustration with the process. In addition to the dramatic changes that have already occurred, DS as a clinical and research arena is on the cusp of developing even newer therapies that have the potential to improve cognitive outcomes. Multiple research teams have protocols already enrolling study subjects. For example, the team at the Jerome Lejeune Institute in Paris has an active study underway that employs a combination of folic acid and thyroid hormone, targeting infants and primarily measuring cognitive performance during and after therapy. Their preliminary work has shown significant promise and preliminary results might be released later this year. Because of their early successes, there are ongoing efforts to mount a similar study here in the United States. The NIH has recognized this new era and has launched an international registry (see https://dsconnect.nih.gov ). However, this “breaking news” has not been widely disseminated. Many worry that recruitment to these studies could be diminished due to the lack of awareness by primary care providers and the general public, which would slow the progress of the studies. Because of the lack of general knowledge of both the dramatic improvements in the lives of individuals with DS and the emerging clinical trials in DS, a coalition lead (of course) by family support organizations has emerged. They have initiated a new “information rights” movement that includes clinicians, policymakers, legislators, and researchers that has worked to enact new state laws addressing the problem of misinformation. The first to successfully pass legislation was Massachusetts: in 2012, a coalition helped to pass a state law, mandating that clinicians provide accurate information and Referral to parent support organizations. Most recently, Illinois, passed unanimous legislation in 2015, which proves that this is truly a bipartisan issue. To learn more about our specialty clinics including the Medical Diagnostic Clinic, visit eastersealsdfvr.org. Yesterday, the State of Illinois entered its 12th month without a a budget, and legislature finished the official spring session without progress. Today we revisit Scott Kuczynski’s January post to help understand the budget stalemate, and review the United Way of Illinois’ most recent snapshot. Updates to the January survey results are expected soon, as human service agencies continue to feel the impact of the budget impasse. Easter Seals DuPage & Fox Valley remains committed to continuing services, though the budget stalemate continues to impact families and human services throughout Illinois. Read part 1 in this budget series here. In part 2 of this Illinois budget series we take a closer look at the future outlook of the state Early Intervention program. The ongoing budget impasse has had profound consequences on nonprofits throughout the state of Illinois. Court orders, laws and federal money have funded many state services and programs. However, 10.6% of the budget currently remains unfunded as the state is not authorized to spend money on these programs without a budget in place. These unfunded programs primarily involve higher education and human services which include child care and many other grant funded programs. Up to this point, there’s been a lack of urgency between the two sides in resolving the budget impasse sparking fears that a budget won’t be reached into the spring or much later. “My most important priority in 2016 is to help pass a responsible budget that meets our essential priorities in securing a safety net for the most vulnerable children and families in our community. The budget stalemate has created an atmosphere of uncertainty in Springfield that has trickled down to individuals in need, human service agencies and communities causing permanent harm in the process. One of the most important things you can do is to communicate the importance of Early Intervention and reaching a budget agreement to State Representatives (Click here for Legislature Mailing List). This involves emphasizing the importance of keeping Early Intervention funding at current levels. Previously there were discussions in Springfield of potentially raising the definition of a developmental delay from 30% to 50%. Increasing the definition of developmental delay would deny thousands of children early intervention services in Illinois. Early Intervention is a crucial program serving more than 20,000 infants and toddlers from birth to three-years old. In addition to the developmental benefits of Early Intervention for children, it’s critical that policy makers understand the fiscal benefits the Early Intervention program provides. Potentially restricting eligibility for Early Intervention will escalate the number of children who need more intensive and costly services in the future. It’s estimated that every $1 spent in Early Intervention saves up to $17 in future costs. By conveying to our elected officials the importance of Early Intervention services we can help ensure its proper standing in the next budget agreement. Include signature with printed name, address, phone number and legislative district if you know it. Include a picture of your family too; we think your statement will be even more impactful. Send a letter to your Legislator. Continue to raise awareness on social media using the hashtag #EImatters. Easter Seals DuPage & Fox Valley remains committed to continuing services. While we are committed to service continuity, we question our ability to do this if the budget stalemate continues. It’s also important to understand how the budget impasse might be impacting families and human services throughout the state. Learn more about Easter Seals DuPage & Fox Valley here: https://eastersealsdfvr.org/. Illinois is entering its seventh month without a state budget. A lack of a budget for this extended period of a time is unprecedented in the state’s history. The prolonged stalemate has resulted from political and ideological differences between Republican Governor Bruce Rauner and Democrats who hold a supermajority in both chambers of the state legislature. Negotiations between the lawmakers have made little progress since the July 1, 2015 budget deadline as there is very little middle ground between the two sides. This is confirmed by Illinois State Representative, Patricia R. Bellock, who notes, “Budget negotiations are still ongoing but I feel it is unlikely that anything will happen until March.” There’s concern in the state that the budget impasse could continue well into the spring or not at all as Governor Bruce Rauner and Speaker of the Illinois House, Michael Madigan, have been unable to make progress towards a budget compromise. Despite the lack of a budget, the state is currently receiving a majority of its funding due to court orders, laws and federal money. This has funded 89.4% of the total budget, leaving the remaining 10.6% unfunded. The unfunded percentage primarily consists of higher education and human services such as child care and many other grant funded programs. This has put enormous strain on nonprofits, many of whom are receiving delayed payments from the state and operating on the premise that they’ll be paid back for human services provided. Until that time, many nonprofits are forced to make tough decisions which have already resulted in cutting the number of clients they serve, cutting staff, utilizing their full cash reserves, and tapping into lines of credit to continue operations. In order to avoid further irreparable long-term consequences for human services agencies across Illinois, it’s critical that the state reaches a budget agreement as soon as possible. 85% of agency respondents have cut the number of clients they serve, up from 34% in July. 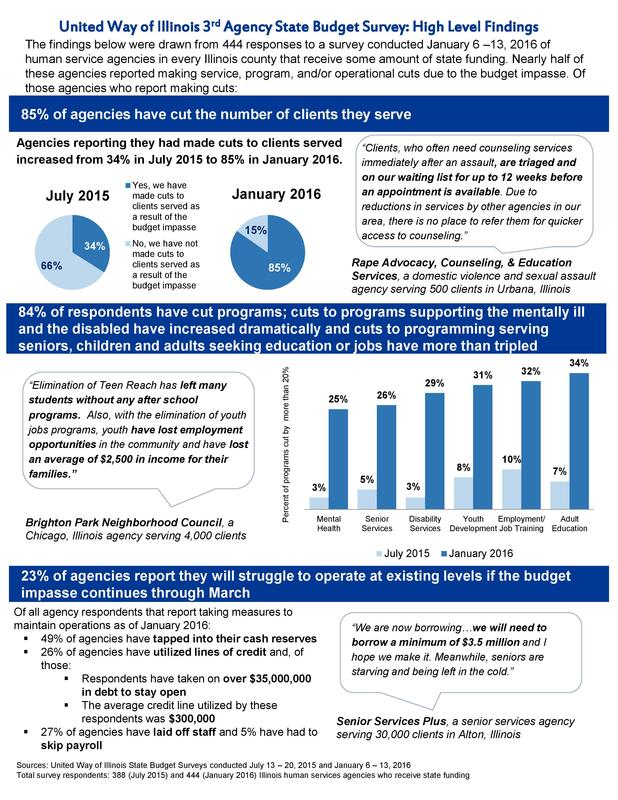 84% of agency respondents have cut programs, most impacting children and working adults. 26% of agencies have tapped into lines of credit. 27% of agencies have laid off staff as a result of the budget impasse. The protracted budget stalemate has caused lasting long-term impacts on human services throughout Illinois. Some agencies have already closed their doors while others are in danger of doing the same the longer the budget impasse endures. They have continued to operate in an atmosphere of uncertainty over delayed payments and potential cuts to critical programs. What does this mean for Easter Seals Dupage & Fox Valley? Stay tuned for Part 2 of this blog series about the budget outlook. Learn more about Easter Seals DuPage & Fox Valley here: https://eastersealsdfvr.org/.